Remember a special acoustic gig on a December night at times of the Dutch Sint Nicolas feast in a small venue of the Vredenburg venue in Utrecht, The Netherlands. A special acoustic gig of Steve Hackett together with his brother John Hackett. It was a beautiful gig with the acoustic guitars of Steve and the flutes of brother John. Still have the autographed program booklet (Cured period). As a young boy I was impressed by the personal meeting of my Genesis hero, his brother John and the beautiful Kim Poor who was responsible for those amazing album covers. The previous years I had witnessed several live gigs of the Steve Hackett band which also included John Hackett on flute. Two years ago (2015) the label Esoteric Recordings released a remarkable John Hackett album entitled “Another Life”. A beautiful album with contributions of keyboardist Nick Magnus. An album of pure beauty that deserved a lot more of media attention that it eventually got. As a wonderful bonus the Deluxe Edition of the new John Hackett album “We Are Not Alone” includes a second disc entitled “Another Live” with live performances of that beautiful “Another Life” album recorded at the Classic Rock Society, the Wesley centre, Maltby On 7 May 2016. 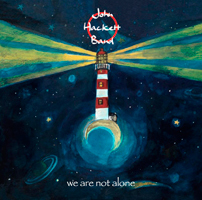 John Hackett formed a real live band and with this band he also recorded the new studio album “We Are Not Alone” which is released on the Esoteric Antenna. Esoteric Antenna is a Cherry Red Records label. When I had bought the “Another Life” album I was impressed by the beautiful vocal parts on that album and to my surprise it was John Hackett himself who was responsible for those parts. The flute player who discovered his own voice ... a remarkable story. The new studio album “We Are Not Alone” is a collection of some harder edged band pieces and more mellow instrumental parts with the beautiful flute of John that you also could find on the “Another Life” album. Some parts of the long (10:11) opener “Take Control Pt. 1 & 2” are reminding me of the atmosphere of some of those early Steve Hackett albums. Maybe that is because John’s flute had an important role on those albums. Speaking of John’s brother, “Never Gonna Make A Dime” is about a story about the Hackett brothers who at an early age where traveling by boat to America. This is where Steve earned his first pennies by playing some tunes on his harmonica. And that is exactly what he does on this track to support the career of his brother. The next instrumental track “Blue Skies Of Marazion” is a piece of pure bliss with flute and classical guitar only accompanied by some delicate keyboard orchestrations. For me one of the highlights of this album. “Summer Lightning” is one of those tracks in which you can enjoy the vocal talents of John Hackett. You can find lovely vocal melodies and some fine guitar parts on this track. “Queenie and Elmo’s Perfect Day” is an instrumental with happy flute tunes and some jazzy and blues oriented atmospheres. Nick Fletcher shows his talents on the electric guitar on this piece. But this counts for the whole album. The album has a kind of balance. The more up tempo pieces are always followed by the more mellow and melodic pieces with delicate vocal and instrumental parts. In “Castles” you can hear a blues oriented guitar part that reminds me of the style of Gary Moore. And in “Ossian’s Lament” there is again that beautiful combination of flute, classical guitar and delicate keyboard orchestrations. On “Jericho” the lead vocals are sung by Jeremy Richardson. The album comes to an end with a longer song entitled “Winds Of Change”. In the first part of this beautiful song the flute of John plays an important role. In the second part of this instrumental you can enjoy a long and amazing guitar solo with a jazzy atmosphere. In the end the flute returns. A worthy ending of a fine album. Together with the opener “Take Control” and the beautiful tracks “Blue Skies Of Marazion” and “Ossian’s Lament”, those four tracks are my favorite tracks of the new studio album. The live bonus CD “Another Live” is a beautiful present for the fans. At that time some of the new tracks were already on the setlist. I am talking about the tracks “Queenie and Elmo’s Perfect Day” and “Castles”. Further you can find lovely tracks like the title track “Another Life”, “Poison Town”, “Forest” and the blissful “Life in Reverse” from the “Another Life” album. An album full of beautiful vocal melodies. I would like to mention also the beautiful track “Overnight Snow” with his delicate flute parts. Beside those beautiful songs you can find some more rock oriented pieces on the “Another Live” album. This Deluxe version of the new John Hackett Band album gives you the best of both worlds. A new studio album entitled “We Are Not Alone” and as a bonus a fine live album with the name “Another Live” which is of course a play on words and reference to the previous studio album “Another Life”. That album was more a solo album made with the collaboration of some musical friends. This new album under the name of the John Hackett Band is a nice introduction to John’s live band. Nice to see that a musician in his fifties finds his voice and starts an own band. Hopefully this remarkable flutist and instrumentalist will generate the success he definitely deserves. There must be a big fan base waiting for him ... because which Prog fan doesn’t remember his beautiful flute parts on those early Steve Hackett albums. Those parts you can find also on this new album. And if you like this album and you missed the previous one “Another Life”... well you know what you have to do.